Elliot's Beach is situated on the Eastern Coastal Plains of India and in the state of Tamil Nadu. The beach lines up the shores of the Chennai, the capital city of Tamil Nadu. 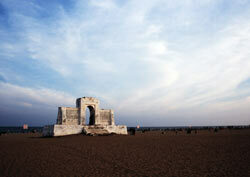 The famous Marina Beach in the Chennai city extends further south and gives rise to the Elliot's Beach. The beach is provided with many attractions that ensure frequent visits by tourists as well the locals residing in the nearby regions. The place makes up a good destiny for people who does not like the hue and cry of the techno city. Elliot's Beach is known for the its serene atmosphere. The beach as such is the cynosure for the youth as well the foreign tourists looking for a bit of privacy. The beach is lined with food stalls and small shops that cater to the beach visitors. The northern part of the beach sees maximum concentration of the visitors. The southern part, the one away from the Marina Beach is a little filthy. Besides the golden sands and the chill of the water, Elliot's Beach also houses some popular shrines. The Velankani Church and the Ashtalakshmi Temple make up the popular sites on the beach. Ashtalakshmi temple, Hundreds of people pay homage at these places. These pilgrim places are located on the northern end of the beach. The Schmidt Memorial dedicated to a Dutch sailor, who lost his life while saving a drowning fellow, is one among the many conspicuous landmarks on the famous beach.